(Back, from left): Phuti Choshi, Jabulani Ncayiyana, Graeme Meintjes, Linda Boloko, Jonathan Peter, Nesbert Zinyakatira. (Front, from left): Jasantha Odayar, Chacha Issarow, Claire Whitaker, Phumla Sinxadi, Kathryn Wood, Boitumelo Fanampe. Story Kate-Lyn Moore. Photo Je’nine May. The Fogarty HIV-associated TB Training Program (HATTP) has begun bearing fruit, having provided training opportunities to six postgraduates since being launched in September 2017. 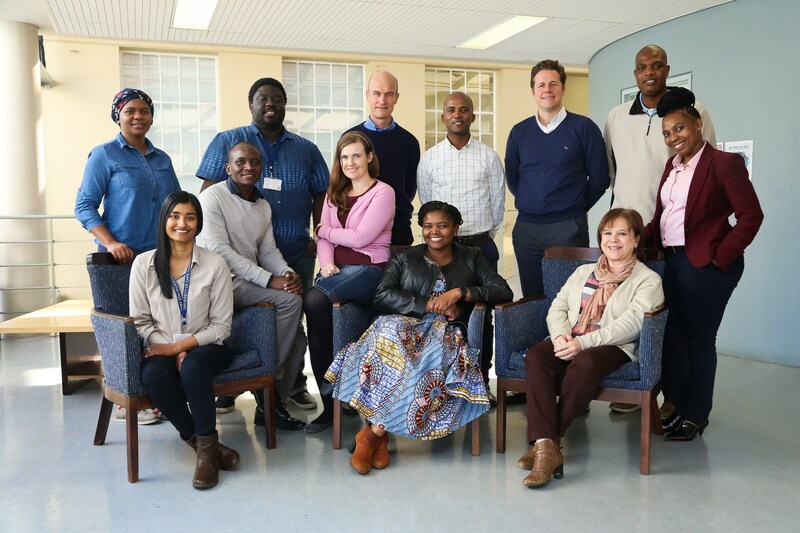 Aiming to develop the next generation of research leaders in the high burden disease area of tuberculosis (TB), and to strategically fill gaps at the University of Cape Town (UCT), HATTP provides short-, medium- and long-term training opportunities in the form of short courses and PhD and postdoctoral fellowships. It is administered by the Wellcome Centre for Infectious Diseases Research in Africa (CIDRI-Africa) at UCT. Four of its trainees, namely Nesbert Zinyakatira and Drs Linda Boloko, Boitumelo Fanampe and Jasantha Odayar, have been selected to attend the Graduate Summer Institute of Epidemiology and BiostatisticsSummer School, which takes place at Johns Hopkins University in the United States from 11 to 30 June. “We are excited to be able to offer these four researchers the opportunity to attend the Hopkins Summer School. The courses offered are intensive and taught by world-class lecturers. They will benefit enormously in terms of new research skills learnt,” commented Professor Graeme Meintjes, who is the principle investigator at HATTP. Zinyakatira holds an MPhil in Demography and is currently completing his Master’s in Public Health, focusing on the impact of antiretroviral therapy (ART) on TB incidence. Boloko is a medical doctor undertaking his MMed research on cardiac surgery outcomes in HIV-infected patients. Fanampe has investigated novel diagnostics for TB and engaged in a study of ART in pregnancy. Odayar has studied TB in pregnancy. Phuti Choshi (a PhD fellow) and Dr Chacha Issarow (a postdoctoral fellow), both received their HATTP fellowship awards and initiated their studies in the first months of 2018. Choshi is engaged in a study of HIV-associated TB as it relates to immunopathogenesis of drug hypersensitivity reactions. She is undertaking her PhD research in the Division of Allergology and Clinical Immunology under the supervision of Associate Professors Jonathan Peter and Rannakoe Lehloenya, and Professor Elizabeth Phillips (Vanderbilt University). Issarow is developing a model to describe the evolution and transmission of rifampicin-resistant tuberculosis in the high HIV prevalence setting of Khayelitsha. His postdoctoral work is being supervised by Associate Professor Helen Cox (Division of Medical Microbiology), and falls within an existing collaboration between UCT, Stellenbosch University and the Swiss Tropical and Public Health Institute. HATTP provides its trainees with numerous additional training opportunities. It held a two-day ‘Entry into HIV-TB Research’ medical students’ seminar in early May, and ensures all of its fellows and trainees engage in ethical research by mandating attendance at a two-day good clinical practice course. HATTP fellows and trainees also participate in a responsible conduct of research training programme, which includes eight hours of online courses, videos and in-person tuition. In its second year, HATTP will recruit another cohort of fellows and trainees, host an annual symposium, and continue facilitating training workshops, seminars, and short courses.